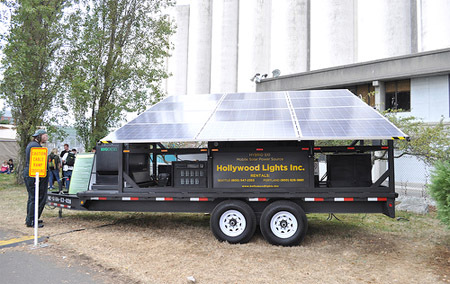 Solar-powered generators refer to all kinds of mobile units as well as solar arrays. A solar-powered generator can refer to both a mobile solar-power generation unit, or the entire solar array itself, which consists of either a solar photovoltaic array or an indirect thermal solar system that uses concentrated solar power (CSP). As an aside, concentrating solar power (CSP) generators make use of mirrors and tracking systems to reflect and focus sunlight onto receivers which collect solar energy and convert it to heat. This heat energy can then be used to generate electricity by means of a steam turbine or heat engine that drives a generator. The best solar generators come in all sizes and configurations, from hand-held units to giant, multi-panel arrays. 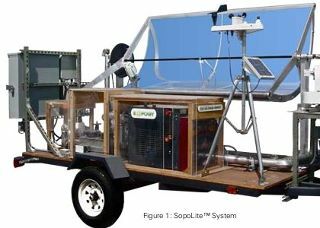 In a mobile solar powered generator, solar panels are situated in various arrangements on the surface of the unit or connected via movable (on wheels) solar panels . The panels convert the sun’s energy into DC (direct current), which can be used for immediate or later use. If the electricity generated is not needed right away, it can be stored in the generator’s battery, which is usually housed in what looks like a car trailer. From the battery, the electricity can either be used in its DC form, or it can be converted in to standard AC (alternative current) for home appliances and possibly a utility grid, by routing it through the generator’s inverter. On-grid solar generator: A Grid tie system allows you to connect your system to the electrical grid. It is typically a hybrid system which means that you can get some power from solar, some from the grid. Solar grid tie systems are meant for the people who want to use solar power without completely switching to it, for getting the dual benefits of solar power and security of being tied to the grid as well. Off-grid solar generator: Off-grid solar power systems are those which are not connected to electrical grid. These systems make an independent home that gets all its power from solar and sometimes from other sources like wind. These types of systems are totally independent of the utility grid and are normally common in areas where electricity is not accessible.